I was in industrial sales for 30 years and then I retired to The Villages, Florida, for three years. I thought: Gosh, I miss Virginia Beach. I’m from Virginia Beach. 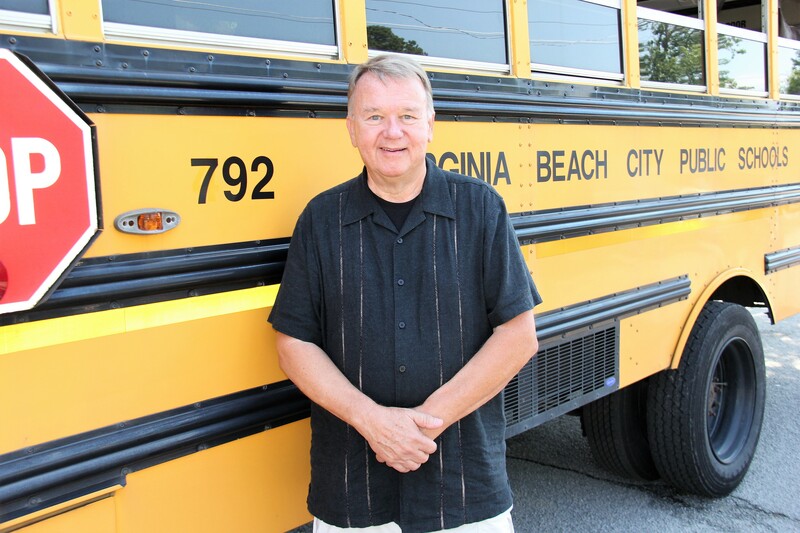 I went to Thalia Elementary; I went to Kempsville Junior High – no air conditioning – and then to Princess Anne, Class of 1968. I didn’t know I was going to be a bus driver. I saw signs everywhere: Gotta have bus drivers! Gotta have bus drivers! I’ve been here about 4 months. My niece drove for them for about eight years or so and she loved it. That’s how I became a bus driver and I love it. I’d rather drive this than my car. And the transportation department – training, dispatch and maintenance – they’re amazing. I’ve been a professional drummer for 53 years. So I think the entertainment part – my personality flows into this so much because I love kids. I have two boys who are grown. One is in Raleigh. The other is in Akron, Ohio. I love to be around people. And my hobby is that I build porch swings, yard swings, deck swings – that kind of thing. I’ve been doing it for 45 years. Is there anything else you would want people to know about you? Do the best you can where you are.